There are myriad Hello Kitty cases for the Samsung Galaxy Tab 3 7.0 on Ebay and ecommerce websites, and Samsung now thinks that there should be a Hello Kitty edition of Galaxy Tab 3 7.0 tablet. As expected, there are only minor cosmetic changes, such as pink chrome lining instead of silver, hello kitty wallpaper, and an ugly sticker on the back of the tablet. Specs include 7 inch display with a resolution of 1024 x 600 pixels, Marvel PXA986 processor based on dual-core ARM Cortex A9 architecture (1.2 GHz clock speed), 1 GB of RAM and 8 GB of storage, which is expandable via microSD card slot. Other specs include 1.3MP front webcam, 3.2 megapixel back camera, GPS, Wi-Fi, Bluetooth and optional 3G module, and a massive 4000 mAh battery. It runs Android 4.2 operating system, and other than custom wallpaper, do not expect to see any new software to please your little sister / daughter. 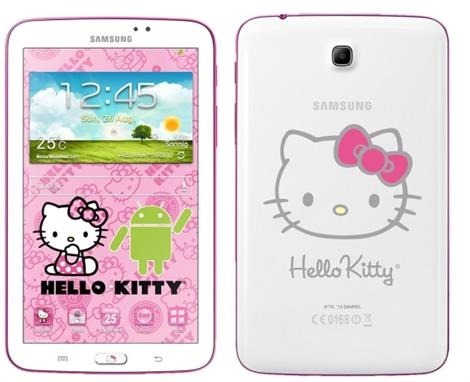 Price, however, is same as non-hello kitty version of Galaxy Tab 3 7.0, which is 229 Euros.